This article is from the Fall 1998 AFRMA Rat & Mouse Tales news-magazine. QI have two male mice that have had a falling out, and I do not want to house them alone. I have housed them together for the last 6 months. After cleaning the cage they would fight, but never seriously. They would settle down by the next day and all would be well. For the first time yesterday, the dominant male drew blood from his brother. We loaded the cage with toys and treats to distract them, but Vadar, the dominant one,was so aggressive he bit us for the first time when we reached in to remove the brother, Speck. What causes such a falling out between two males? Why now? I thought once a submissive posture is taken by a male, the dominant one backs off. Do I have any choice but to house them separately? 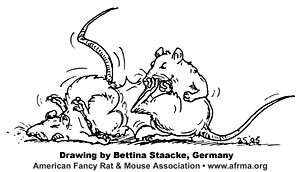 AMale mice don’t normally get along very well together for very long. Usually by the time they are 4–8 weeks, you will have to separate them. Sometimes males will get along fine with minimal fighting for many months. It sounds like you will have to separate them and give them lots of toys, a wheel, tubes, etc. Male mice can do very well alone, or you can keep a female with him if he loses condition. However, you will have babies every 3 weeks to find homes for unless you have a retired female that is no longer producing to put with the male. I separate my males when they start to fight and they do fine by themselves. QWhich do you prefer as housing for mice: wire cages, glass/Plexiglas aquariums, or hamster tube systems? How many mice (females) can live happily in a 15-gallon long aquarium? AI prefer glass or Plexiglas aquariums for housing mice. I have found that wire cages can be dangerous because mice occasionally try to stick their heads through the bars. Sometimes they succeed, then turn their heads so that the bars catch them just behind the ears. They find themselves stuck and panic, often hurting themselves badly while trying to escape. Also, wire cages are drafty and messy since bedding can easily escape. Hamster tube systems can be used, though they are difficult to clean. If you own male mice, the soft plastic bottoms of these cages may absorb their odor. Once this has happened, they will always have a strong smell.